Holdings of McGill Library’s Rare Books and Special Collections and Blackader-Lauterman Library of Architecture and Art. Main floor lobby of the McLennan Library Building and continues on the fourth floor lobby and Reading Room and the Blackader-Lauterman Library of Architecture and Art on the third floor of the Redpath Library Building. Lovers of the eclectic style that dominated international design from 1925 to the early 1950s arrive in Montreal on May 24 for the 10th World Congress on Art Deco. In celebration of this event, the McGill Library would like to welcome you to join us as we re-discover the magic of a period that defined an era. Exhibitions in several locations will explore lithographs alive with the energy and excitement of the twenties, uncover the unique fashion and accessories of the period in the pages of the Gazette du bon ton: art, modes et frivolities, highlight the distinctive book design infused by the colourful and energetic spirit of the times, walk us through life in Montreal in the period and offer insight into the ongoing influence on modern design with a display of recent publications on all aspects of Art Deco. Join us as we uncover treasures from the holdings of McGill Library’s Rare Books and Special Collections and Blackader-Lauterman Library of Architecture and Art. The exhibit debuts on the main floor lobby of the McLennan Library Building and continues on the fourth floor lobby and Reading Room and the Blackader-Lauterman Library of Architecture and Art on the third floor of the Redpath Library Building. The 1925 Paris Exposition Internationale des Arts Décoratifs et Industriels Modernes was the first time that decorative and applied arts held centre stage and the only criterion for the exhibits was that they be “modern”. Art Deco embodied a luxurious style with sleek lines using bold colour contrasts and modern machine-age materials such as plastic, chrome, Bakelite, stainless steel, glass and lacquer. The term “Art Deco” came into use after a retrospective exhibition entitled Les années ’25, held at the Musée des Arts Décoratifs, Paris, in 1966. The style was applied to all aspects of life, especially to the design of modes of transportation such as trains, ships, cars and airplanes. Posters, advertisements and magazines of the day promoted travel. Manufacturers adopted Art Deco design motifs and produced streamlined clocks, radios and sophisticated products that represented speed and efficiency. Ladies’ fashion and jewellery did the same as did gentlemen’s tailoring. Fashions were luxurious and flamboyant and designers such as Paul Poiret and Erté flourished. The influence spread to furniture, sculpture, architecture and graphic design. 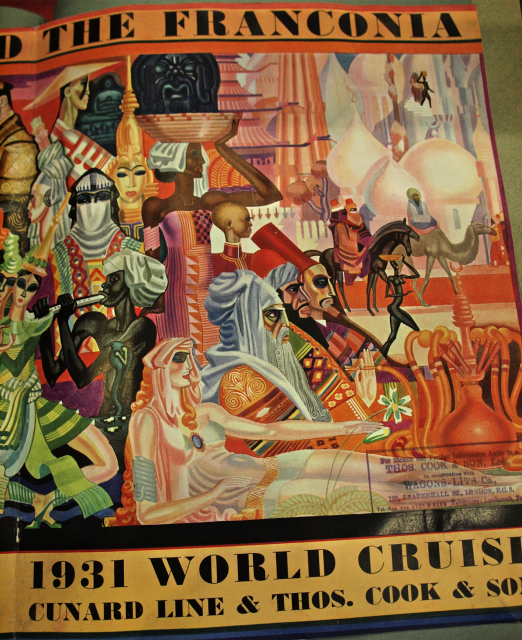 The 1925 Exposition Internationale had a major influence on the decorative arts in America, even though the United States did not exhibit at that time. In the 1920s and 1930s many aspects of American film were affected by the moderne style including set design and decoration, actresses’ costumes, publicity posters and the architecture of movie palaces. Jazz was born and soon became the sound of the era. In Paris, New York and London, stage productions and extravagant revues used opulent Art Deco sets. The present exhibition is in celebration of the 10th World Congress on Art Deco being held in Montreal, Quebec, May 24 – 30, 2009. It displays examples of Art Deco design in various formats and styles including ephemera, popular magazines, book-bindings, typography and advertisements from the holdings of the Rare Books and Special Collections, McGill University. The exhibit continues on the fourth floor Rare Book Lobby and Reading Room where the theme is English and French life in Montreal in the 1920s and 1930s. The Blackader-Lauterman Library of Architecture and Art has on display a case of recent publications on all aspects of Art Deco. This exhibition has been organized by the staff of Rare Books and Special Collections and the Blackader-Lauterman Library.